SUMMARY: Christian, a boy raised in a cave by a troll, falls in love with Princess Marigold, who is both cursed and destined to marry royalty. 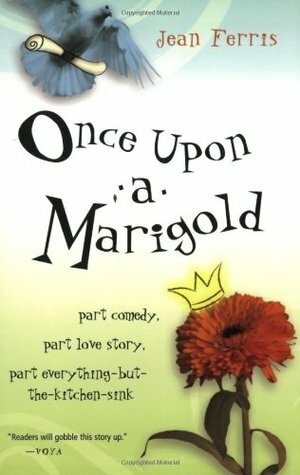 REVIEW: Cute but silly, Once Upon A Marigold is mildly popular in my school, particularly with the sixth grade girls. I think I would have enjoyed this one more if I were about 25 years younger. Christian is a really cute protagonist, and I love that both Marigold and Christian are intelligent and enjoy reading. Ed, the troll who raised Christian, is super cute with his mixed up phrases and his not knowing what to do with a precocious six-year old. While it's very predictable, I think teachers and librarians should make this series available. It's very clean, cute, and young readers will love it. THE BOTTOM LINE: For me, a bit silly and predictable, but for young readers, it will be a hit. STATUS IN MY LIBRARY: We have all three books in this series, and I will be recommending it a lot to my sixth grade girls.